Of u nou een oscilloscoop nodig heeft voor algemeen gebruik, onderzoek en ontwikkeling of voor wetenschappelijke doeleinden, de hoge resolutie PicoScope 4000 serie is degene die u nodig heeft. The 2–channel PicoScope 4226 and 4227 are precision USB oscilloscopes that are suitable for general, scientific and field–service use. With 12–bit resolution (adjustable up to 16 bits in enhanced resolution mode) and 1% accuracy they also make an excellent choice for noise, vibration and mechanical analysis. Your PicoScope 4226 and 4227 are powered from the USB 2.0 interface, so there’s no need for you to carry an external power supply or batteries with you. The USB port also delivers high–speed data to your PC to give you a responsive, high–resolution display. With up to 250 MS/s real–time sampling, the PicoScope 4426 and 4227 are the fastest USB–powered 12–bit scopes available. The PicoScope 4226 and 4227 are supplied with PicoScope oscilloscope software. PicoScope is your complete test and measurement lab in one easy–to–use application. As well as a fully–functioning oscilloscope with advanced features such as digital persistence, math functions and automated measurements, PicoScope software also allows you to use your PicoScope 4226 or 4227 as a spectrum analyzer, function generator and arbitrary waveform generator. 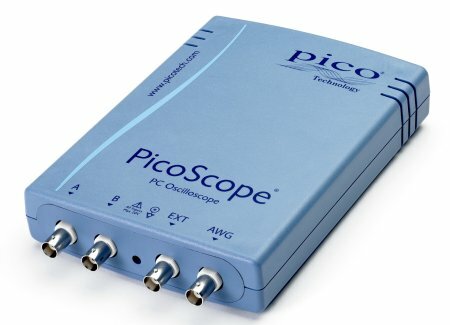 PicoScope is free to use on as many PCs as you like, it’s regularly updated with new features and enhancements, and you can always download the latest version — for free — from our website. The PicoScope 4226 and 4227 are our 6th generation of 12–bit PC oscilloscopes. With over 20 years’ experience in PC–based test equipment design we know that our users deserve — and demand — quality, performance and affordability. We don’t disappoint. With up to 100 MHz bandwidth, 250 MS/s real–time sampling, 12 to 16 bits resolution and 1% accuracy the PicoScope 4226 and 4227 are powerful and fast oscilloscopes. But your PicoScope is much more than an oscilloscope: with an integrated spectrum analyzer, function generator and arbitrary waveform generator your PicoScope is a complete test and measurement laboratory that is small enough to take anywhere.